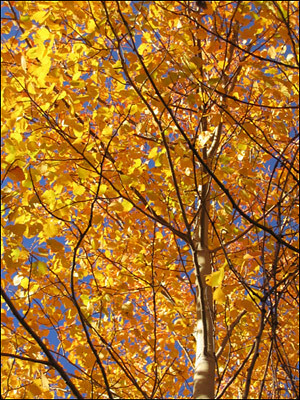 [caption id="" align="alignright" width="300" caption="A poplar dressed in fall colors."] [/caption] Fall foliage tends to linger in Virginia, thanks to our varied geography. Mountain trees peak earlier than farmland trees, while trees closer to the shore peak last. Spend a month staying in different country inns Virginia, and enjoy a month of peak fall foliage. Numerous country inns Virginia offer seasonal specials, and now through mid November is the perfect time to take advantage of fall foliage specials. The inns vary widely, though all meet the most strident standards for hospitality. Stay on a 40-acre horse farm and enjoy hiking, horseback riding, and evening bonfires. View fall colors from the comfort of a kayak near the Virginia Shore. Breathe in the fragrant scent of freshly harvested hay in your country inn Virginia Shenandoah Valley, and enjoy magnificent fall colors while sipping wine on the porch of a Blue Ridge Mountains b&b. We suggest allowing ample time to explore the country roads of Virginia as you travel from one inn to the next. The Virginia Department of Forestry recommends several excellent fall foliage driving tours (which can, of course, also be traveled by bike) throughout the state. Look for scarlet and purple dogwood trees, golden yellow poplar leaves, and brilliant scarlet red maple leaves. For more details, please visit their website. Take it slow, drive with the windows open, and stop whenever possible to crunch leaves underfoot.